Welcome to this interactive planning and development process overview, developed in collaboration with The City of Calgary, Urban Development Institute - Calgary, and the Canadian Home Builders’ Association - Calgary Region, with contributions and insight from the Federation of Calgary Communities. Residential development has different characteristics in a new community than in an existing community, and this is reflected in the current approach to planning reviews and approvals. This web site is an 'executive summary' of the steps in single family residential development for new communities, moving from provincial and city-wide policies through to serviced, occupied communities. It will be updated as required to respond to changes and new planning system enhancements made as a result of The City’s Transforming Planning Program and the Build Calgary initiative. Future plans include documenting other types of development and redevelopment, such as multi-family residential, industrial, and commercial forms. an easy to use interactive tool to help manage the amount of detail and logically move from general to more specific information, with links to key resources currently available from the City of Calgary and its partner groups. Timelines are provided for each of the major stages of development and are to be considered as general targets that may vary due to a number of factors. In some cases, timelines may be reduced through closely coordinated sequencing between the stages, in other cases they may be influenced by time to prepare reports and studies, and in still other cases development may be premature due to servicing availability and other growth management considerations. Some construction activities are also seasonal in nature or weather-dependent. As a general note, the terms 'Landowner', 'Applicant,' and 'Developer' are used interchangeably throughout the sections of this timeline. In general it is understood that a Landowner may be functioning as a Developer and also have a consulting team working on her behalf to act as the Applicant for approvals and permits at various stages of the process. As a high level summary the site is unable to address every possible new community development scenario (such as when a development permit may be required), nor can it interpret or supercede any of the acts, codes, bylaws, policies that are referenced here, however over time efforts will be made to revise and enhance the content based on use and feedback. Planning is the process of shaping the physical environment to achieve an orderly, economical and compatible pattern of urban growth. The process involves decision-making on many different levels and is informed by a sequence of policies acting at different physical scales, moving from the province, to the region, to the city, to an area of the city, to a community within that area, a parcel in that community, and a building on that parcel. Some of these policies are 'statutory' meaning they are legally binding and need to be adhered to, others are ‘non-statutory’ meaning that they are best practices or suggested direction to be taken into consideration. Each of these policy levels may be supplemented by additional guidelines that address certain topics of interest like Open Space, or Urban Design. 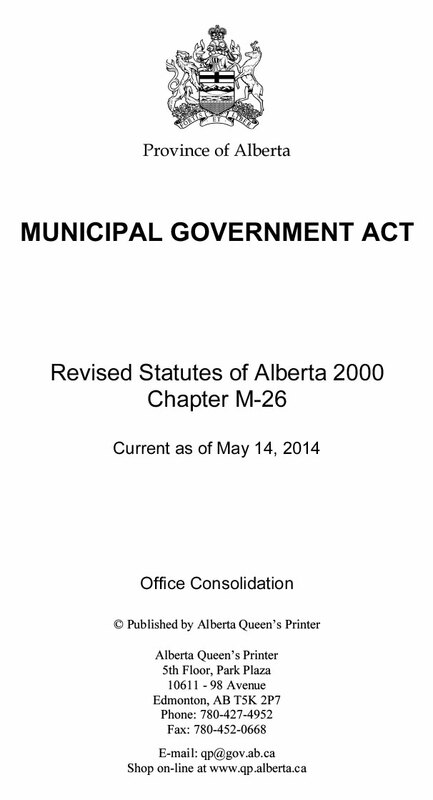 The Municipal Government Act (MGA) provides the legal framework for making planning decisions at the municipal level. It establishes a hierarchy of plans, identifies Authorities, and provides statutory guidelines for administration and procedures for making decisions and appeals on planning matters. The MGA also enables, and (in some cases obligates) The City of Calgary to create statutory plans. Among other provincial policies and regulations, the Subdivision Regulation sets out the statutory framework and requirements for dividing land into smaller parcels. The MGA requires Alberta municipalities with a population of 3500 or more to adopt a municipal development plan setting out general planning directions. 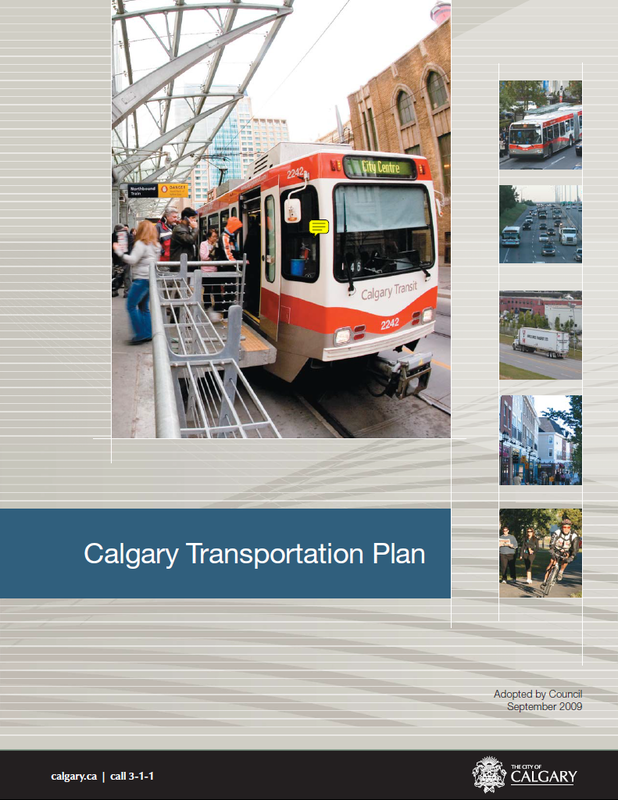 The Plan It Calgary process created an integrated Municipal Development Plan (MDP) and Calgary Transportation Plan (CTP). The MDP includes information on how it is to be interpreted and implemented. The MGA also requires that each municipality adopt a Land Use Bylaw (LUB). A LUB regulates the use and development of all buildings and land within the municipal boundaries. The LUB works in concert with other documents and is used, on a site-by-site basis, to implement planning policies. Many areas of the city are also contained within a Regional Context Study (such plans were formerly referred to as Regional Policy Plans). A Regional Context Study (RCS) is a non-statutory plan for large sectors intended to provide a level of strategic planning between the Municipal Development Plan (MDP) and subsequent Area Structure Plans (ASPs) and/or community plans. establish the sequencing of subsequent ASP preparation to ensure that urban growth proceeds logically and efficiently. An Area Structure Plan (ASP) is a long-range planning document and is typically the first step in obtaining planning approval for a new community. An Area Structure Plan is a 'statutory' plan prepared per the regulations of the Municipal Government Act. Area Structure Plans for new communities in undeveloped, 'Greenfield' areas will achieve the goals of the Municipal Development Plan (MDP) and the Calgary Transportation Plan (CTP) through a detailed policy framework which will guide future development applications on those lands. As mentioned in the Introduction, the lands (especially if newly annexed) may also be referenced in an existing Regional Context Study. Area Structure Plans are prepared by The City’s Local Area Planning and Implementation Business Unit in collaboration with representatives from other City Business Units (such as Parks, Transportation, and Water) and formally adopted by Council. Area Structure Plans are prepared in close consultation with the landowners and developers, municipal service providers, outside servicing agencies (e.g. school boards, utility companies) and affected interest groups. An initial draft of the plan is circulated to all parties affected by the proposed development including adjacent communities. Landowners in or within proximity to a proposed Area Structure Plan boundary have an opportunity to become involved, submit ideas, and ensure consultants/agents are available to facilitate conversations with City planners. First, it refines and implements The City’s broad planning objectives and policies of the Municipal Development Plan and other policies by promoting logical, compatible and sustainable development. Second, it guides and directs all subsequent work - the land use, subdivision and development decisions that collectively determine the form that the plan area will take. This includes making decisions on the types of development, transportation systems, population and jobs, intensity, the sequence of development, and the provision of essential services and facilities. Historically, an Area Structure Plan took between two to three years to prepare. At present, it typically takes between nine and twelve months, with approximately two to four months required for final approvals. Council authorizes Administration to proceed in preparing an Area Structure Plan for the identified Area. City Administration informs Council on start dates for Area Structure Plans based on capacity analysis. Subsequently, landowners and adjacent residents are informed that an Area Structure Plan is underway. Keep apprised of Calgary Planning Commission and City Council agendas. Become familiar with any commitments made prior to annexation of your land into The City of Calgary. Inquire about any Regional Context Studies that contain your land. Consult with other landowners or developers who are within the proposed policy plan area to ensure common goals are met and any costs associated with Area Structure Plan preparation are proportionately shared. Consider retaining a consultant to help navigate through the Area Structure Plan preparation process and provide reasonable comments. What are some actions that I (as a landowner) can be take to avoid delays at this stage? As a part of due diligence, talk to adjacent landowners, especially if your land has been annexed. Become involved early in the process to better ensure your concerns are addressed in future drafts. 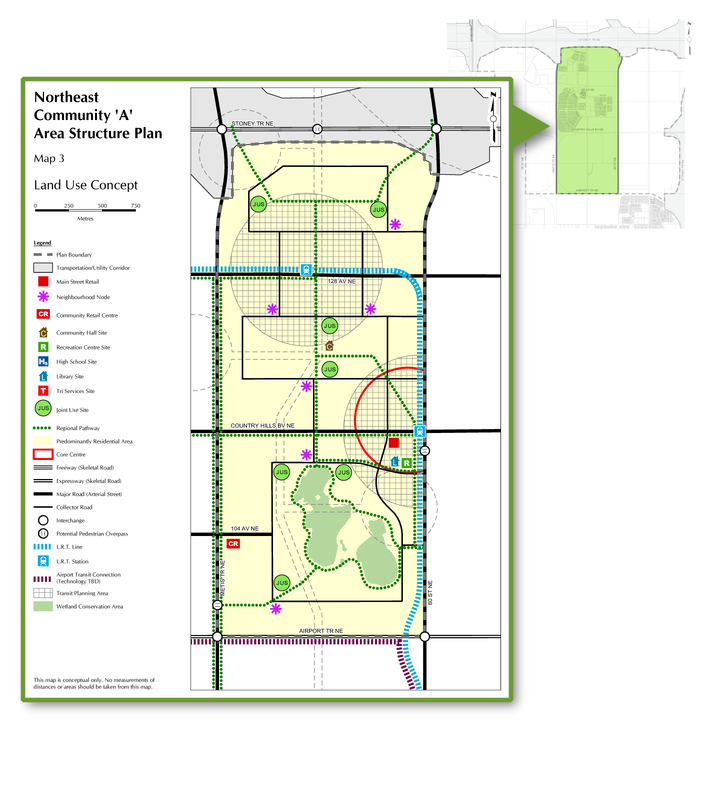 This stage of Area Structure Plan preparation is intended to identify how Area Structure Plans for new communities in undeveloped, 'Greenfield' areas will achieve the goals of the Municipal Development Plan (MDP) and the Calgary Transportation Plan (CTP). During this analysis transportation, parks, water, and other infrastructure needs are identified. The Technical Analysis also identifies a target density of people and jobs per gross developable hectare can be achieved over the life of the plan. Planners, in consultation with other City departments and with guidance from the Municipal Development Plan/Calgary Transportation Plan, perform a technical analysis of land use with the intention of aligning to MDP/CTP goals/targets. Data is assembled by The City’s Geodemographics team to determine land uses and densities, in order to measure alignment to MDP targets. City Administration directs the timing of inputs for technical data/studies, advising agents/consultants when and what types of data are required. Some of the reports generated include (but are not limited to) a Phase 1 Environmental Site Assessment, Biophysical Inventory, Historical Resources Overview and Slope Stability Analysis. Any existing Regional Context Studies are also consulted, as they may determine configurations and sequencing of land area groupings (referred to as Cells). Be involved. Actively participate in the communication and engagement process the City undertakes. This includes: attending landowners meetings; open house events; review of draft materials; and submission of written comments. Early involvement improves the chance of your concerns being incorporated within the Area Structure Plan Policy. How can potential delays be avoided at this stage? Considering the Municipal Development Plan and with a vision for your land in mind, think ahead to what you may or may not be willing to compromise. Engage with City Administration to discuss potential issues with Cell groupings and sequencing. Landowners and agents/consultants should ensure their technical studies are complete and available to City Administration as requested. The Policy Formulation stage of Area Structure Plan Preparation utilizes the information gathered during Technical Analysis to determine the physical form (land use concept), support maps (corridors, pathways, etc.) and land use policy of the plan area. policies to identify density and intensity minimum and maximum ranges within the plan boundaries. A key tool at this stage is The City's "New Community Planning Guidebook." It consolidates policies that are common to all Area Structure Plans and provides the core policies necessary for a new condensed report format. The Guidebook is then supplemented with any additional policies required in a particular plan area arising from further analysis of the local context. The land use concept is presented to the public via an open house and/or other communication and engagement opportunities. The developed policies are circulated to landowners and their consultants/agents for review. Understand the policy being formulated and to take a position on proposed amendments. Talk to the area Councillor to ensure your interests are transparent. Become familiar with the New Community Planning Guidebook. It has been incorporated into the latest version of the Municipal Development Plan. There will be more volumes of the Guidebook available as they are developed for additional forms of development such as Industrial and Commercial areas. The Calgary Planning Commission (CPC) is a committee appointed annually by City Council to make recommendations to Council on land use planning matters. CPC conducts a review based on planning merit to verify that the Area Structure Plan policy as developed advances the principles of City Council and the Municipal Development Plan/Calgary Transportation Plan. City Administration writes a report and provides the Area Structure Plan to be placed on the CPC meeting agenda. The meeting of CPC is held to review the document and ensure the principles of City Council and the MDP/CTP are met. City Administration makes a presentation and answers questions from CPC. CPC makes a recommendation of approval or refusal to City Council for decision, or CPC can refer the document back to City Administration to make changes as requested. In this event, City Administration would then consider the changes and return to CPC for review and ultimately a recommendation decision. 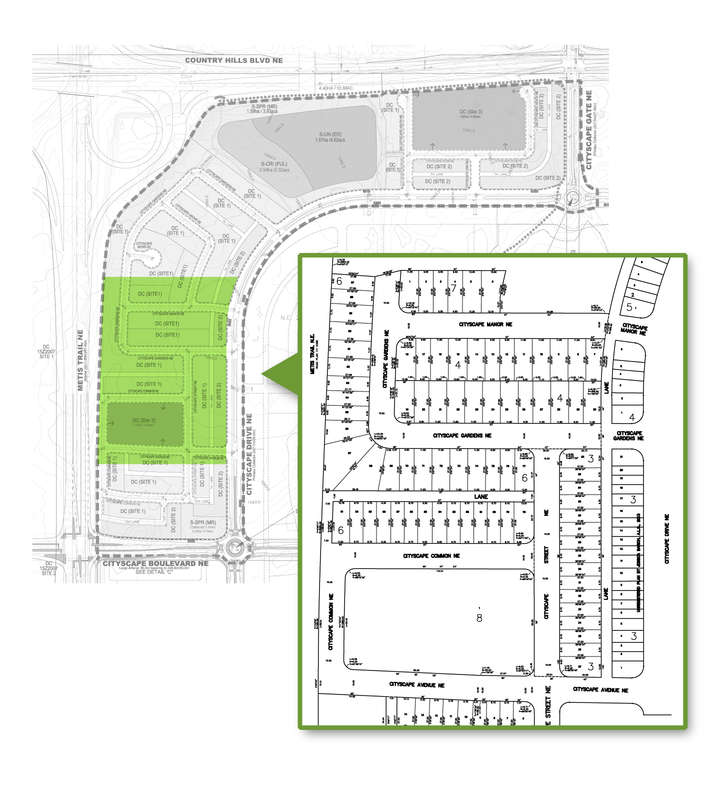 You may wish to write a letter to CPC indicating your position regarding the Area Structure Plan as drafted. You may also wish to attend the CPC meeting in-person or watch the proceedings online. The public is notified of dates and agendas via an advertisement in the Calgary Herald newspaper published two weeks in advance of the meeting. Be apprised of updates or amendments to the Area Structure Plan made as an outcome of CPC review. Ensure your needs have been communicated at an earlier stage in the process. Any issues arising at this point could result in required amendments and delay the process. 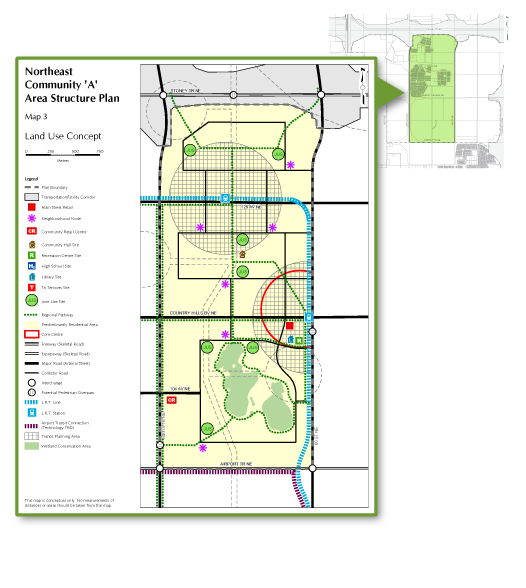 Final approval of the Area Structure Plan policy is provided by City Council following the resolution of any issues or amendments arising as a result of review by Calgary Planning Commission. A public hearing is held to provide an opportunity for anyone who wishes to speak in favour or in opposition to the Area Structure Plan. After CPC has made a recommendation, the Area Structure Plan is included as an item for the Combined Meeting of Council. In this case, the term 'Combined' refers to the grouping of Public Hearing and Regular Meeting items. City Administration provides an overview presentation of the Area Structure Plan, intended to address a general, less technical audience, with a focus on public engagement. Council asks questions of clarification as required. Members of the public are invited to speak in favour or in opposition to the Area Structure Plan. Council asks questions of clarification as required. A motion is made to adopt the Area Structure Plan as a Bylaw of Council. The motion is either passed or refused. Alternately, the item is tabled to a later meeting or referred back to City Administration for further amendments. 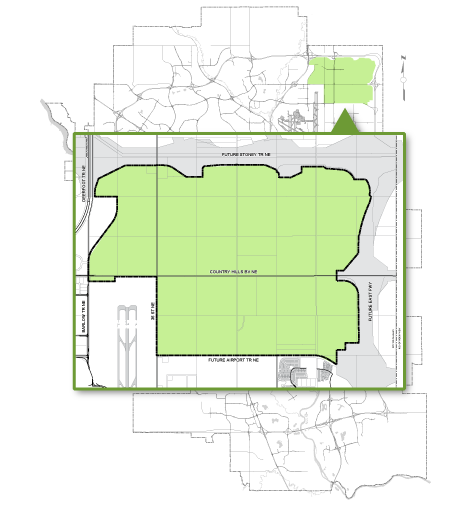 You may wish to write a letter to Council indicating your position regarding the Area Structure Plan as approved by the Calgary Planning Commission. You may also wish to attend the Council meeting in-person and speak to the item during the public hearing (or have an agent/consultant do so on your behalf). Alternately you may watch the proceedings online. Be apprised of updates or amendments to the Area Structure Plan made as an outcome of the Council decision. As with the CPC review, ensure your needs have been communicated at an earlier stage in the process. Any issues arising at this point could result in required amendments and delay the process. Growth Management describes the process that City administration uses to provide Council with transparent, consistent and reliable information about the costs, timing and locations for growth in Calgary. A Growth Management Analysis is a determination of the capacity of the transportation, water, and fire infrastructure required to support urban development for their respective benefitting areas. For infrastructure not yet built, the analysis addresses the means of coordinating development with the funding and financing of City infrastructure and services. The Growth Management Overlay (GMO) serves to direct development in the Plan Area to lands where growth management issues need to be resolved. The presence of an Overlay suggests that sufficient transportation, water and/or fire response capacity is not yet available in the "overlay" area. Based on this, the path to remove a growth management overlay is neither completely standard nor does it guarantee a particular outcome. It is, however a platform for dialogue and further analysis around options and alternatives to meet the purpose and outcomes of Growth Management. Growth Management is being further developed and refined as part of the Build Calgary Initiative, and the information contained in this section is subject to change. 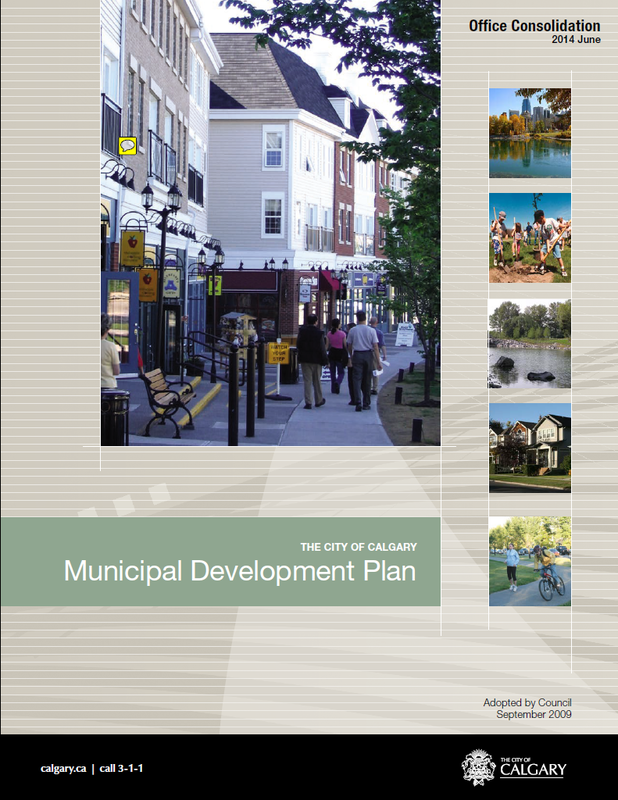 Promoting the goals and objectives of the Calgary's Municipal Development Plan (MDP), with regards to developing communities with complete services sooner, and reach the overall goals of population growth in the developed and developing areas. Setting priorities areas for City departments to align future capital and operating budgets to process the required services (supports #2). Providing greater certainty for the development industry. By communicating infrastructure investment plans over the short, medium and long term, critical information on when land is planned to be serviced is available to developers. Providing the appropriate level of serviced land for all development types. While the timeframe for any given parcel of land to be suitable for development depends on a number of factors such as budgets and sequencing, evaluating a proposal to support the removal of an overlay typically takes 6 months (and is exclusive of the time required for the applicant to prepare the proposal). Associated timelines may also vary or evolve as a result of the Build Calgary Initiative. If The City has identified the area as a priority for investment, it will be indicated in the current 4 year capital budget that the required fire, water and transportation services are available or will be built within the current budget cycle. This allows the overlay to be removed and outline plan applications can proceed. The catalyst for removal is communicated through the budget. The City’s Corporate Growth Management group works with City Departments and Council to set growth management priorities and coordinate departmental capital spends with respect to location and sequence. Ensure you are familiar with any local area policy in place for your land, The City’s Sequenced Lists, and the 4 Year Budget and 10 Year Capital Plan. These documents are the best course for determining required infrastructure, what costs are assumed, and where your area sits relative to others in The City's prioritization framework. It is also prudent to review The City's "Suburban Residential Growth Report" in order to understand general land supply conditions. If your lands are in areas that are not prioritized for growth within the current budget cycle, ensure you are familiar with the funding and financing proposal framework articulated in the New Community Guidebook (MDP Part II) and in the Principles and Guidelines for Financing and Funding. If The City has not identified the area as a priority for investment, the developer may submit a funding and financing proposal for funding the required water, transportation and fire services in all or a portion of the plan area. The proposal should align with Council’s Principles and Guidelines for Financing and Funding. An approved proposal becomes the catalyst for an agreement between The City and the developer regarding the infrastructure funding and subsequent removal of the overlay. No template or formal document exists for preparing a proposal, however the required specifics are articulated in the New Community Guidebook (MDP Part II) and in the Principles and Guidelines for Financing and Funding. The proposal is submitted to Corporate Growth Management who conducts an initial assessment of the completeness of the proposal in order to set and manage expectations. Following this initial assessment, Corporate Growth Management coordinates a review of the proposal, which is likely to include City departmental representatives and City growth management committees. The review is done to determine inefficiencies and/or merits of the proposal. Service infrastructure under review consists of water, transport and fire infrastructure. Finance reviews and does a risk analysis. The outcome is a recommendation to Council, routed through the Priorities and Finance Committee (PFC). Work with City representatives to compare your proposal against their own expectations for infrastructure planning and costs. If proposing interim servicing, consider permanent and downstream costs as well. Also consider the incremental operating and life cycle cost impact of your development. Consult City budget documents to determine if required infrastructure is programmed in the 10 Year Capital Plan(s). Finally, consider the land supply situation relative to your proposal. 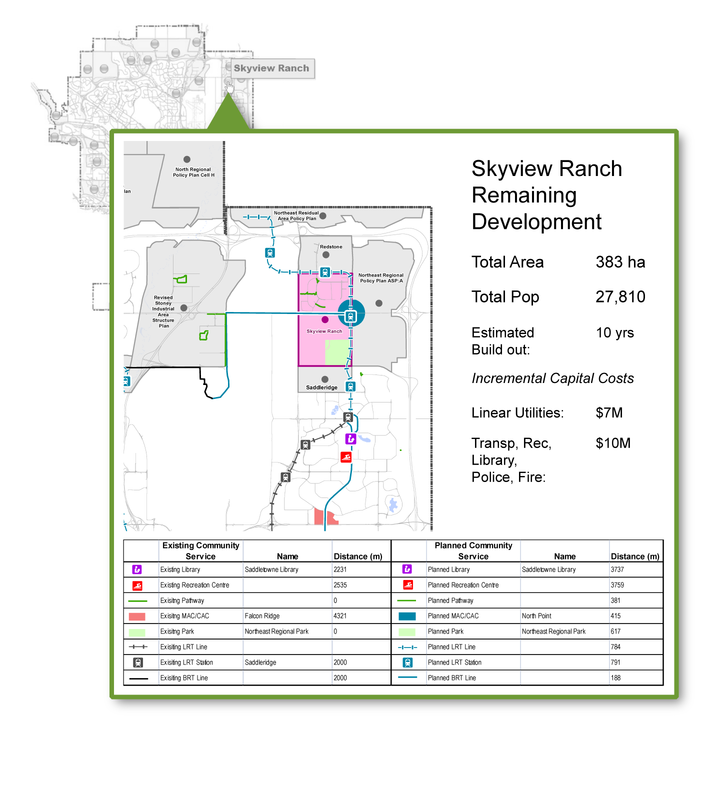 Land supply details are available in The City’s Suburban Residential Growth document. Ensure your proposal is as complete as possible prior to submittal, and considers the points above. While follow-up proposals and negotiation may be possible on certain aspects, these back and forth methods tend to take a lot of City staff and developer/agent time. Once the developer and City representatives have found agreement, the Agreement and/or a progress report will proceed to the Priorities and Finance Committee (PFC) and Council. Successful approval allows for the removal of the Growth Management Overlay. At this point, it is anticipated that all funding and financing proposals will be heard by PFC before proceeding to Council. PFC and Council have the option to approve, refuse, amend, or refer the proposal back to Administration. The proposal may be refused if it is determined that The City is within its land supply targets, or if the financial costs and risks are not acceptable to The City. If the proposal is approved, The City and the developer will begin work on formalizing the proposal within agreement(s), and the subsequent financing, permitting and construction steps necessary to develop the land. The Outline Plan is a non-statutory site plan that is usually processed together with Land Use Amendments, to ensure a workable distribution of land uses, open space and road networks (i.e. land use districts, the location and classification of streets; the distribution and size of the parks and school sites in the neighbourhood). The approving authority for outline plans is the Calgary Planning Commission, who make a decision in consideration of recommendations from City staff (formally referred to as 'City Administration' or just 'Administration'). A Land Use Designation is a legal control on the use and intensity of development on a parcel of land and is defined in the Land Use Bylaw. 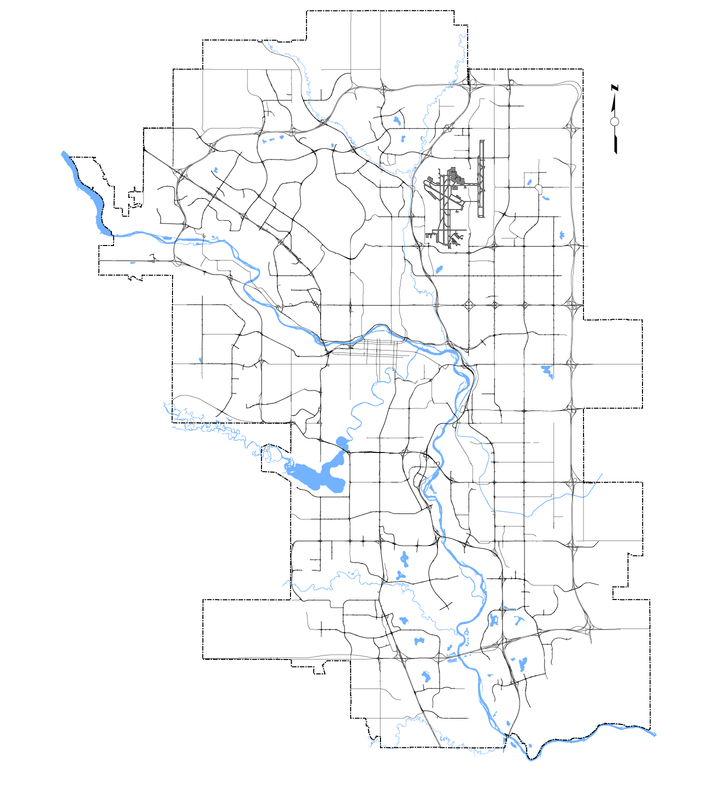 Undeveloped or annexed land is given a default designation that must be changed in order to implement the Outline Plan and the broader vision established by the Area Structure Plan and by extension, the Municipal Development Plan / Calgary Transportation Plan. This is accomplished through a Land Use Bylaw Amendment Applications (also referred to as Land Use Redesignation, or informally referred to as rezoning). It is processed concurrently with an Outline Plan or as a stand alone application. The approving authority for Land Use is the City Council, who make a decision in consideration of recommendations from the Calgary Planning Commission and Administration. Occasionally Land Use Amendments may also prompt discussion and proposed amendments to the Area Structure Plan. The Outline Plan forms the framework for the subsequent subdivision process. Conditions associated with Outline Plan approval are carried forward into the subdivision plan and form part of the subsequent Development Agreement. Subdivisions and Development Agreements are described in further detail in the next section. Land Use Amendment/Outline Plan reviews typically last between 9-12 months from the date of application (this is exclusive of the pre-application enquiry which is further described below) Both the Land Use Amendment and Outline Plan are processed at the same time. In general, pre-application enquiries provide an opportunity to discuss a proposal with a planning team prior to making a formal submission, and for some types of planning applications is optional, however given the scope and comprehensiveness of Land Use Amendment and Outline Plan proposals a pre-application enquiry is considered essential. The outcome of the pre-application enquiry is to highlight potential issues with the proposal, determine the scope of required reports (such as transportation studies) and any additional supporting reports or technical plans that may be necessary to review an application. A request for a pre-application meeting is made by contacting 403-268-5311 and an application form is sent. The form outlines the types of materials and number of copies required. Upon receipt of the completed form, materials and fees, a planner is assigned and the pre-application materials are then sent to representatives from City Departments for review and comment, identifying required information as well any major issues or challenges the applicant will need to address prior to submitting the formal application. The planner then summarizes these comments in a 'Pre-Application Assessment' document that is provided to the Applicant and a meeting is scheduled with the applicant and planning teams to discuss. Submit requested materials per the pre-application enquiry form and ensure consultants are available to attend the pre-application meeting. One of the main purposes of the pre-application step is to prevent delays from occurring later in the process. Landowners may benefit from the involvement of consultants who are familiar with the local context in order to identify any aspects of a proposal that may require additional collaboration or resources to address. Applications are made in-person and by appointment. Upon submission of an application, an initial screen is conducted to check that all required documentation is present. Applicable fees are collected at this time. The complete application is assigned a file number. The file is then referred to the Local Area Planning and Implementation business unit. The Local Area Planning and Implementation business unit is divided into 3 groups of Planners, each designated to a different geographical area of the City. A file will be assigned to a Planner in the appropriate group, who then acts as the File Manager in charge of coordinating the application circulation and processing. The File Manager will determine if further clarification from the applicant is needed and how many copies are required from the applicant prior to circulating it to other City departments and affected community members. Make a submission per the 'Complete Application Requirement List' (there are separate lists for Land Use Redesignation and Outline Plan applications) along with any additional requirements identified at the pre-application stage and reflected in the Pre-application Assessment document. Applications can only be circulated for subsequent review upon the completion of required studies, including those identified by the pre-application meeting. After the application is submitted and a File Manager is assigned it is then evaluated by various City representatives from Planning, Transportation, Parks, and the Utilities and Environmental Protection departments. The application is evaluated on its urban planning merits, technical aspects of the application such as servicing and transportation components, and compliance with City planning objectives and policies, including (but not limited to) the Municipal Development Plan / Calgary Transportation Plan, Area Structure Plan, and supporting studies such as Wetland Conservation Plans. When the application has been deemed ready to circulate by the File Manager, additional copies of the application will be requested at that time. The City's Corporate Planning Applications Group (CPAG) distributes the application copies to internal and external parties review and comment. 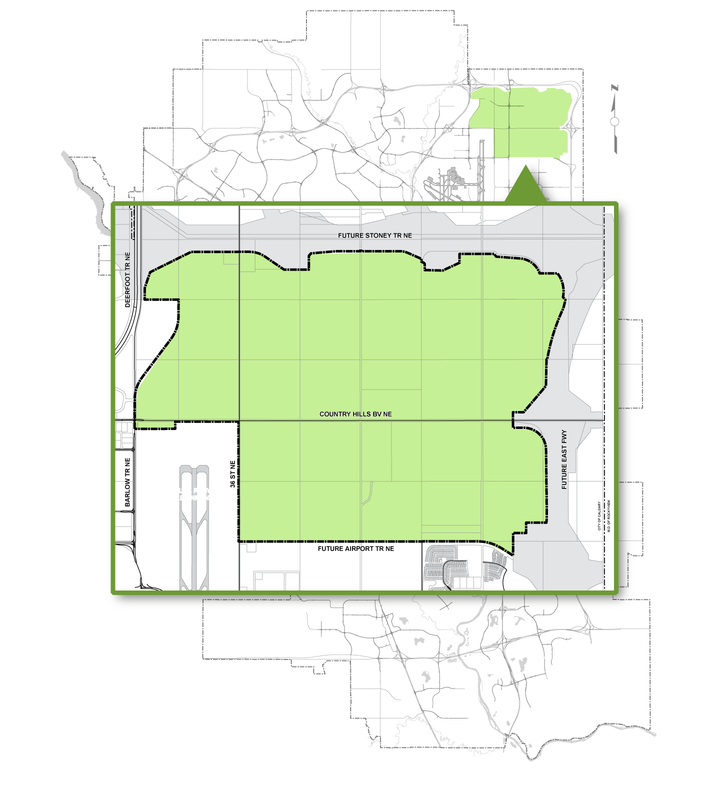 The extent of the circulation is based on the size, type, and containing community/ward boundaries of the application. Adjacent landowners are notified of a Land Use Bylaw Amendment application and a notice posting sign will be placed on the subject site at this time. The purpose is to provide information about the proposal and the planning process, as well as an opportunity to comment on the proposal. The Applicant may host open houses and/or provide project information to the public. If the application involves an Area Structure Plan amendment or it is felt to be of public benefit The City may host additional open houses. Circulation replies are required within a specified timeframe and are reviewed by the Planner for consistency of requirements and conditions. Planning comments are also made at this time and a 'Detailed Team Review' (DTR) document is prepared that summarizes the list of outstanding issues with the application. The applicant is then notified that the circulation is complete and will receive a copy of the comments. During this time it may be helpful for you and/or your consultant team to meet with adjacent landowners as well as be available to answer any questions that may arise from City departments who are reviewing the file. While it is not required for Land Use Amendment and Outline Approval, it may also be advisable to begin to think ahead to items that will be required at the Subdivision stage such as potential provincial approvals required under the Water Act, and supporting drawings to be prepared by a Professional Engineer. Following the Detailed Team Review there is a period of negotiation with the applicant to resolve any identified issues and changes to the plan may be requested. A Post Circulation meeting is held with the applicant and participating City Departments to resolve issues arising from the Outline Plan and Land Use Amendment circulation process. The Corporate Planning Applications Group coordinates and chairs this meeting. Commonly this results in a follow-up submission of revised plans or additional documents that address the comments and issues. These documents may also be circulated, however typically not to the extent of the original circulation. This process continues until both City representatives and the applicant are reasonably satisfied and conditions of approval are established. At the end of this stage a report is prepared for the Calgary Planning Commission along with a recommendation of approval, or alternately a refusal in situations where the applicant and The City may not have been able to achieve sufficient agreement on the planning merits of the proposal. In such cases any unresolved issues or requirements are also documented in the report. Participate in the Post Circulation meeting and submit revisions to the plan as appropriate. Maintain dialogue with City staff and confirm lines of communication among your consultant team. 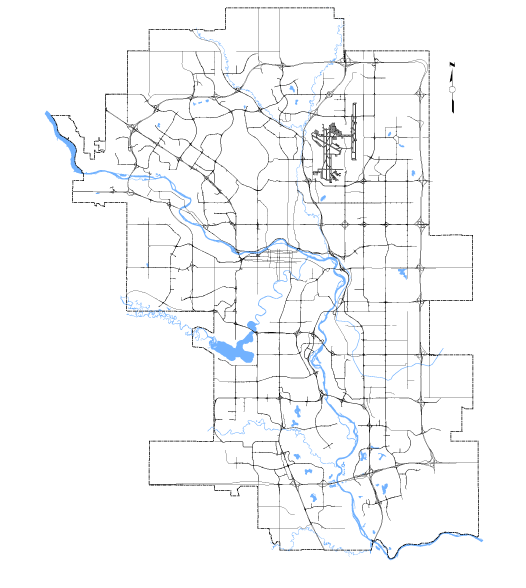 The Calgary Planning Commission is a Council-appointed committee of Councillors, citizens, and City General Managers, whose mandate is to provide either decisions (with authority as delegated by Council) or recommendations to help inform decisions made by Council, depending on the type of application. In the case of Outline Plans, the Calgary Planning Commission is the approving authority. They may act as a mediator in resolving disputes between the City and the applicant. There is no appeal route for outline plans as they are not statutory documents. For Land Use Amendments, the Calgary Planning Commission is not the approving authority however it can either request changes to the proposal or forward the report along with their recommendation to City Council. City Administration prepares a report and provides the Outline Plan and Land Use Bylaw Amendments for review on a CPC meeting agenda. The report takes into consideration all of the circulation responses, approved Council policies and other relevant planning considerations, and includes Administration's recommendations for approval or refusal and supporting rationale. The report is presented by City staff and unlike a Council public hearing (described in the next step) the applicant typically does not have an opportunity to speak. Occasionally however, the CPC will ask questions of the applicant or the applicant's representatives to further explain certain aspects of the proposal. It is also important to be apprised the outcome of the CPC review. Ensure if possible that issues have been resolved prior to the CPC review, and that the application is moving forward with recommendation by Administration for approval. Any issues arising at this point could result in required amendments and delay the process. Final approval of Land Use Bylaw Amendments is provided by City Council following the resolution of any issues or amendments arising as a result of review by Calgary Planning Commission. A public hearing is held as required by the Municipal Government Act. The public hearing is also an opportunity for anyone who wishes to speak in favour or in opposition to the proposal. After CPC has made a recommendation, the Land Use Bylaw Amendment is included as an item for the Combined Meeting of Council and a notice of the public hearing must be advertised. City Administration provides an overview presentation and Council asks questions of clarification as required. Members of the public are invited to speak in favour or in opposition to the proposal. Council asks questions of clarification as required. A motion is made to adopt the proposed bylaw amendment. The motion is either passed or refused. Alternately, the item is tabled to a later meeting or referred back to City Administration for further amendments. Council's decision is final and only appealable to the courts on a point of law. You may wish to write a letter to Council indicating your position regarding the proposal as approved by the Calgary Planning Commission. Be apprised of updates or amendments to the Land Use Bylaw Amendment made as an outcome of the Council decision. Proactive engagement at an early stage with adjacent landowners and other stakeholders to address concerns where possible, and providing a record/timeline of these activities to Council can provide helpful context to Council's consideration of the proposal. Approved Outline Plans are distributed to all affected City Departments and agencies, as well as the applicant. Approved Council minutes for Land Use Amendments are distributed by the City Clerk to the appropriate segments of the Administration for modification or inclusion of existing plans or by-laws and redistribution to other areas of the Administration, applicants and the general public as required. The approved Outline Plan is a non-statutory document that includes design details and the general location of the various land uses, however it does not show individual lots. Subdivision is a legal process as mandated by the Municipal Government (MGA) of dividing land into smaller parcels which meet servicing and other regulatory requirements, including new legal descriptions. The process is governed by a Subdivision Authority that is authorized to make subdivision decisions on behalf of The City. In Calgary the Subdivision Authority is currently the Calgary Planning Commission (CPC) and the Senior Subdivision Officer as authorized by the Calgary Planning Commission. Subdivided lots are registered with the Province and become part of Alberta's Legal Survey Fabric. Agreements are entered into and construction plans are reviewed that set the stage for subsequent installation of utilities and construction of civil infrastructure. If the application is complete and all conditions are met this phase of the process typically requires about twelve months to complete from application to final registration, depending on the complexity of the development. When the land use redesignation is approved, 'Tentative Plans' can be submitted as part of a Subdivision application. Tentative Plans show the complete lotting pattern together with all dimensions and sizes. 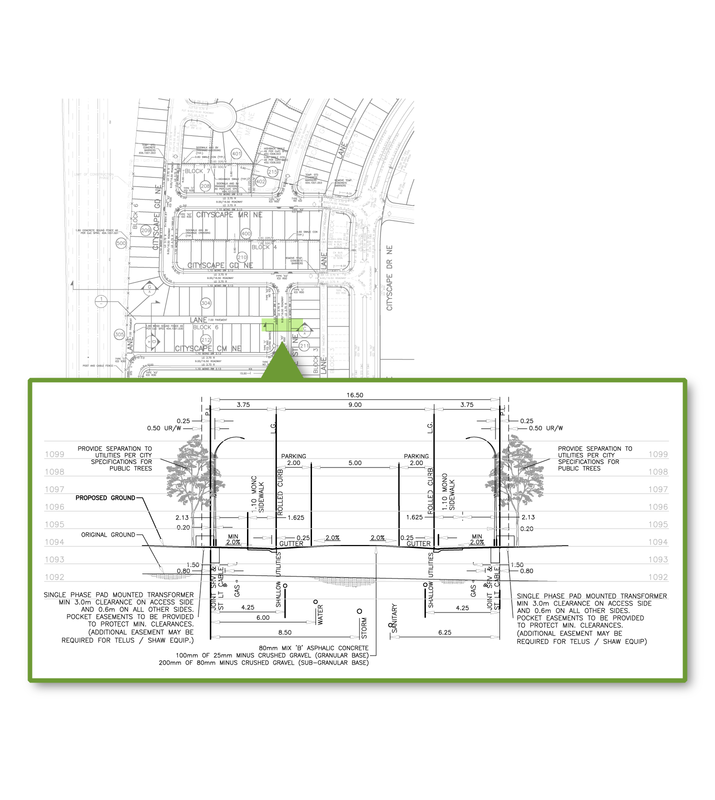 All subdivision applications are submitted online via the ePlans system. Upon receipt of application, an initial review is conducted to ensure that all required documentation has been provided as part of the application. Applicable fees are collected at this time. The complete application is given a file number and a File Manager is assigned from the Local Area Planning and Implementation Business Unit. An analysis of surrounding conditions is conducted. This means identifying adjacent land uses, existing road networks, trunklines for water, sanitary and storm sewer and electrical power. The application is typically circulated to other City Departments via the Corporate Planning Application Group (CPAG). CPAG consists of representatives from Transportation, Water Resources, Planning and the Parks Departments, as well as other more specialized divisions as required. The CPAG review consists of an interdisciplinary review of the subdivision proposal, to ensure it follows the intent and conditions of the approved outline plan for the area and addresses the technical aspects to site development. Provincial agencies and utility agencies (e.g. Telus) may also be circulated for comments. If there is no Area Structure Plan or Community Plan adjacent landowners must be notified as well. Following the circulation period, a Detailed Team Review (DTR) is organized to ensure the input of specialist resources is captured on the file. A DTR will consist of a written document which outlines the adjustments or additional information that is needed prior to approval. The Applicant is required to respond to the DTR in writing, addressing all the comments that were made. This may include revisions to the Tentative Plan and/or providing additional documentation or information. Once all the DTR comments have been addressed, CPAG provides a recommendation of approval or refusal and the file is sent to the Senior Subdivision Officer for decision. A decision must be made on the Application within 60 days, unless the applicant and the Subdivision Authority agree to a time extension, as outlined in the Municipal Government Act. A decision is then made and the applicant is sent an information package. This package contains the approved, stamped application form, conditions of approval, and any other documents required to be registered along with the subdivision are sent to the applicant, along with instructions regarding next steps. The approval is valid for one year. As this is a statutory plan, there is the possibility of appeal of the the Subdivision Authority to the Subdivision and Development Appeal Board, but in some cases also to the Municipal Government Board. Appeals are to be commenced within 14 days of receipt of the written decision. The progress of the application can be followed electronically. Ensure that when your receive information (DTR Form) after a CPAG detailed review you perform the necessary actions to move the process forward. Check your Certificate of Title for any restrictive covenants prior to submission. If provincial approvals are required as per the Water Act, it is advisable to engage as early as the Outline Plan / Land Use Amendment stage. A set of plans that outlines how the infrastructure of the development is to be constructed including underground services and surface improvements. The plans are reviewed in accordance to design standards that have been established. These standards promote a suitable level of functionality, durability, and maintainability of the infrastructure. The process consists of two, main functions - the preliminary review and the final approval. The preliminary review documents City standards that have not been met. After completion of the preliminary review, the applicant revises and submits for final review construction drawings to meet City standards. The final approval ensures that all requirements have been met. Both reviews are conducted by a multi-disciplinary team of engineering representatives from City departments and external representatives (such as Canada Post) as coordinated by the Development Servicing group of the Inspections and Permit Services business unit. Have qualified Consultants submit various applicable reports such as Stormwater Management, Stripping and Grading, etc. that pertain to the area of development. Ensure an accredited Consulting Engineer is hired to complete the design of your development to ensure that all City standards and requirements have been followed and completed. 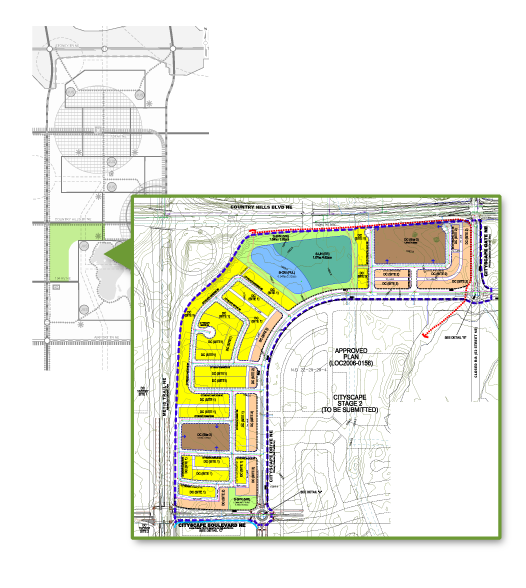 The approval of the Tentative Plan gives the developer permission to contact Growth Management (Subdivision Section) through Urban Development Online (UDO) to request a Development Agreement. If application through UDO is complete this triggers the preparation of the "Development Agreement." (DA) to be entered into between The City and the Developer. A Development Agreement is comprised of a Master Development Agreement(MDA), an Interim Indemnity Agreement (IIA) and a Special Clauses Agreement (SCA). All are legal contracts between the City and the Developer. These Agreements are used for all residential, industrial and commercial developments and will be provided to the Developer at various stages of the Development Agreement timeline. The IIA is typically the first agreement to be created upon requesting a DA, it requires the Developer to provide both Performance Security and Insurance applicable to the particular phase of Development. Once executed, there is a Development Agreement number assigned. This will allow for the request of permission to install/construct the City infrastructure contemplated under this agreement. The MDA sets out the terms and conditions under which development of the lands are to take place within the city limits including the responsibility to construct public infrastructure and any associated financial obligations. This Agreement is negotiated every five years with a review of the content on a yearly basis. The negotiation is with the City Departments, City Council and the Development Industry (through the Urban Development Institute - Calgary). The SCA contains the special clauses that are applicable to the specific phase of development and a map that outlines the area of Development. The special clauses comprise the information that is contained in both the conditions of approval and the applicable construction drawings. The accompanying map is used to clarify the content of the special clauses and define the boundary and show any offsite obligations to the phase. Engineering Construction drawings are required be submitted for preliminary review prior to requesting a Development Agreement. The Developer or Consultant (depending on their business relationship) will log into the City's Urban Development Online (UDO) web site to create and submit a request for a Development Agreement. The staff in Growth Management (Subdivision Section) will review the application for content and completeness. Once the application is approved the Subdivision Section will start the process by providing the Developer access and instructions on how to endorse the IIA and complete the return package. The entering into a Development Agreement process will continue with the circulation and review of the Special Clauses, the creation of the Special Clauses agreement and the Master Development Agreement. As a requirement of the Master Development Agreement the land owner is to employ a Consulting Engineer, who shall be identified in the Special Clauses Agreement, to design and supervise all work to be carried out under this Agreement. Return all agreements (IIA, MDA, SCA) in a timely manner with required documents and endorsed properly . Once a subdivision application is approved (conditionally or otherwise), the final step is to receive Endorsement from the Approving Authority. For subdivisions by tentative plan, the final plan is called the Legal Plan or "Linen" . This plan provides an accurate record of the survey markers placed in the ground, in the form of iron pins, from which dimensions are taken. It shows detail as to location, orientation, and size of all parcels. The applicant is required to take the approved tentative subdivision plan to an Alberta Land Surveyor who will create the linen and an addressing mylar. A Development Agreement number is required to be obtained per the previous step. The linen and the addressing mylar are then submitted to The City for circulation and endorsement prior to registration at Land Titles. The addressing mylar is submitted with the Endorsement Package and is reviewed by The City's Addressing group, who then assigns addresses to the new lots. A letter is sent to the applicant advising them of the new addresses. After receiving final Endorsement from the Approving Authority, the applicant can then take it to new titles. The applicant has one year from the date of approval of the subdivision to submit for endorsement. If the file has expired, the applicant may write to the Approval Authority to request an extension. They also have one year from the date of endorsement to register the final document at the Land Titles Office. If the endorsed documents are not registered at the Land Titles Office within a year of the endorsement date an extension may be granted by The City, however this will take additional time to process. Moreover, the transfer of title of lots can only occur once the plan is registered and new titles created. Once the land has been subdivided and the civil engineering design for the infrastructure has been approved, grading and construction of the essential infrastructure can begin. This phase focuses primarily on utilities located within public road right-of-way and includes both underground services (such as water, sewer, electrical) and surface improvements (such as paving and sidewalks). This phase is intended to ensure that the essential infrastructure is in place to support the release of Building Permits and subsequent construction on the individual lots. A process of site inspections and approvals also helps ensure that construction has taken place according to approved plans. This phase of the development process typically requires about nine to twelve months to complete, and can have a three to six month overlap with Subdivision. This step involves the removal of trees, shrubs, and/or topsoil, and the initial grading of the surface of the land, subject to any conditions that have been put in place as part of the review and approval process. Stripping and rough grading approval may be sought as soon as the Outline Plan and Land Use Designations are approved by Council, and may be obtained in one of two ways. 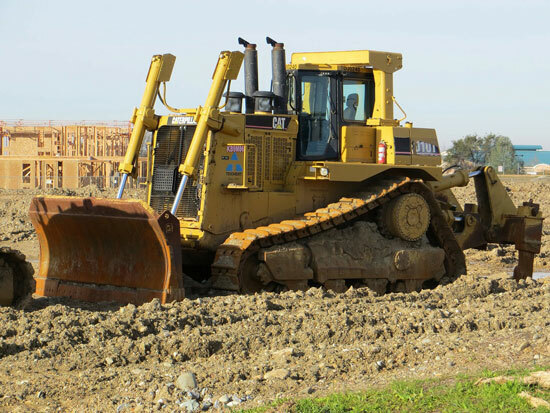 Firstly, if a Developer will be performing stripping and grading operations over multiple phases of development, a Development Permit for stripping and grading will be required, and an application is to be made per the Complete Application Requirement List (CARL). Alternately, if the stripping and grading operations are limited to one phase of development, the stripping and grading can be performed under the authority and requirements of the Master Development Agreement. Following an initial screening for completeness and the collection of fees, an application is typically circulated to other City Departments via the Corporate Planning Applications Group (CPAG). An interdisciplinary review is conducted to examine the implementation of the outline plan, including geotechnical, slope stability, material handling and erosion control matters. Comments are summarized and returned back to the applicant. Revisions to the application may be required to address the comments. Once all of the comments have been addressed, CPAG provides a recommendation of approval or refusal and the application is sent to the Development Authority for decision. With approval in place, stripping and grading activities may take place. Upon completion of stripping and grading a detailed report,shall be submitted to The City,outlining all geotechnical and/or environmental items encountered during the stripping and grading as well as the remedial measures taken. Retain the services of qualified engineering consultants and contractors per The City's "Consulting Engineer's Field Services Guidelines." Additional requirements may apply if school sites, reserve sites, or areas of environmental significance are contained within the stripping and grading boundary. This step includes the installation of Sanitary, Storm and Water mains within the City road right of-way to service the Development Agreement area. Upon completion of Preliminary and Final engineering drawings (as outlined in the previous section) and permission to install is granted the Developer may proceed with the installation of the Underground Utilities. Prior to construction relevant City Business Units are to be notified that installation is about to commence. A contractor installs based upon the approved construction drawing design and contract documents prepared by the consulting engineer. The contractor is responsible for the quality of work. The consulting engineer is obligated and responsible to provide at least the minimum level of inspection and field services as specified in each section of The City's "Consulting Engineer's Field Services Guidelines". The consulting engineer shall keep adequate records to satisfy the manager that the work is being constructed and installed in a safe and approved manner. In order for construction permission to be granted the terms and conditions of the Special Clauses of the Development Agreement need to be agreed upon and the appropriate security, insurance certificate, and indemnity provided in accordance with the Development Agreement. 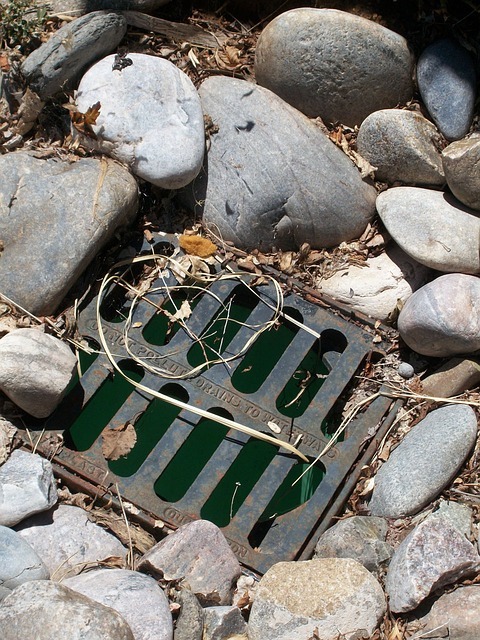 Additional requirements may apply if construction permission is required for a stormwater management facility, including a letter of approval from Alberta Environment. This step includes the installation of Paving, Curbs, Gutters, Sidewalks, Catch Basins, Leads, Street lighting, Fences, Municipal Reserves, Municipal School Reserves and Public Utility Lots. After receipt of permission to construct has been granted the Developer is permitted to proceed with the construction of the Surface Improvements. As with underground utility installation, in order for construction permission to be granted the terms and conditions of the Special Clauses of the Development Agreement need to be agreed upon and the appropriate security, insurance certificate, and indemnity provided in accordance with the Development Agreement. Following the construction of Underground Utilities and Surface Improvements, a verification takes place to ensure that they have been built in accordance with City Specifications and approved construction drawings. This is accomplished through the issuance of Construction Completion Certificates (CCCs). is acknowledged and dated by the Coordinator of Subdivision Development, Growth Management. Construction Completion Certificates and supporting documentation per The City's "Engineer's Field Services Guidelines" are provided by the Consulting Engineer or Landscape Architect after the infrastructure contemplated has been installed /constructed. The Coordinator of Subdivision Development, Growth Management or his/her designee determines whether the CCC is rejected, acknowledged or acknowledged with omissions. In addition, an inspection of the installation is completed by the Coordinator of Subdivision Development or their designate. Copies of the acknowledged CCCs are forwarded to the appropriate parties. Construction Completion Certificates can be tracked using a password-protected online system, available to authorized developers and their consultants. Construction Completion Certificates can only be accepted once all parties have executed the Development Agreement. This step encapsulates the remaining endorsements/approvals that are required prior to making lots available for Building Permit applications to be submitted. The Consulting Engineer provides a Building Grade Plan (BGP) for approval to the Subdivision section of Growth Management. The Building Grade Plan is then circulated to Water Resources for review. The approved Building Grade Plan also forms the basis of a 'Grade Slip' for each individual lot to determine excavation depth and locations. Grade slips are prepared by the Consulting Engineer and are required at the time of Building Permit application. The Subdivision Section will ensure that all of the relevant cost sharing (endeavours) has been satisfied, and that required CCC's are in place. In addition, the Subdivision Section will verify that underground utilities are installed to ensure fire hydrant coverage. Once the package has been approved the Subdivision Section will endorse the release of Building Permits to the Inspections and Permit Services business unit. Retain the services of qualified engineering consultants per The City's "Consulting Engineer's Field Services Guidelines." In order for Building Permits to be released the Legal Plan (linen) must be submitted to the Land Titles Office for registration and the parcels need to have an approved municipal address (Refer to the Subdivision stage for additional information). Once the essential infrastructure has been installed, the construction and occupancy of show homes and houses can commence. This phase is managed through the issuance of Building Permits (BP) and an associated inspections process. The Building Permit that is issued for a new single-family or semi-detached home is referred to as a Single Construction Permit (SCP) as it combines Electrical, Plumbing & Gas and other trade approvals into a single permit. The main focus of the Building Permit is the safety of construction and the requirements of the Alberta Building Code. In lieu of a Development Permit a verification also takes place that the requirements of the Land Use Bylaw (as defined through the Land Use Amendment and Subdivision process) for the proposed house have been met. The outcome is that purchasers take occupancy of their homes and the parcel Title changes hands. The issuance of a Building Permit also typically triggers payment to The City per the Development Agreement. Current target deadlines for Single-Family and Semi-Detached dwellings in developing communities areas are 21 days from BP submission. The construction process itself generally takes between four to nine months to complete. When a home is ready to begin construction a Building Permit (BP) is required before the work can commence. A BP is a legal document consisting of a permit placard, conditions of approval, and a copy of the approved construction documents. Applicants are required to prepare a detailed package of information as per the 'Complete Application Requirement List' (CARL) for the proposed construction prior to applying for a BP. Applications for BPs in developing communities may be applied for online or in person at the 3rd floor of the Municipal Building. Paper applications are pre-screened at the counter to determine they are complete and acceptable for review. A similar process occurs with online applications with the exception that correspondence is conducted via email notification. Once the application is accepted a partial permit may be issued immediately upon request and payment from the applicant. The partial permit allows construction of below ground works and foundation up to and including subfloor. If the proposed construction will be used as a Show Home additional information will be required with the application. Drawings of any temporary construction such as links between homes or sales centres are needed as well as a letter from the builder indicating that the Show Home will be used no longer than 2 years. 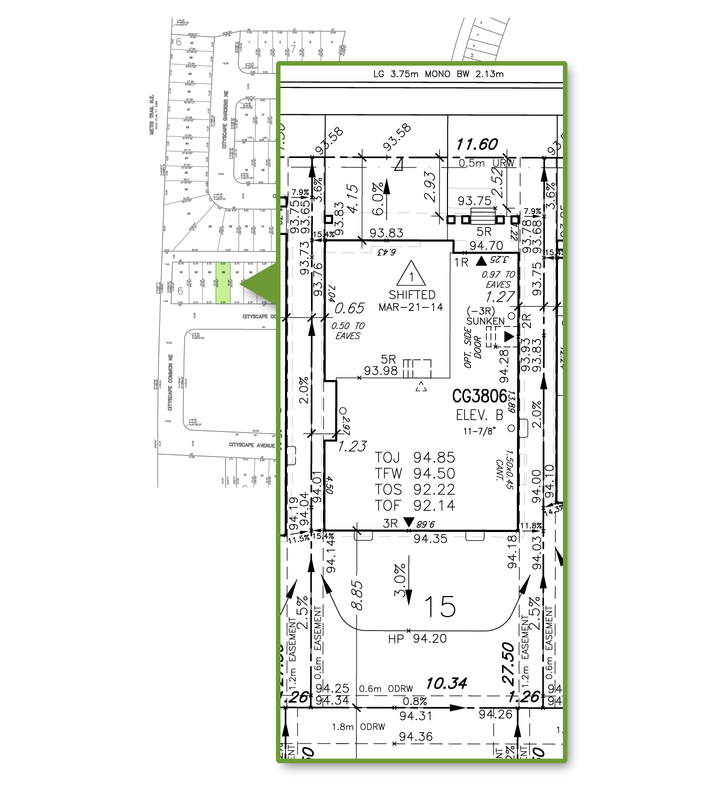 The permit is first circulated internally to Planning Technicians to determine if the proposed construction meets all applicable Land Use Bylaw requirements. The Planning Technician will contact the applicant to request revisions related to Bylaw matters if required. Once the permit has been verified through this 'bylaw check' it is sent to a Safety Codes Officer (SCO) for review in accordance with the Alberta Building Code (ABC). Providing all information is acceptable and complete a building permit may be issued within the 21 day target issue date, though incomplete or inaccurate information may cause delays. The status of a building permit may be tracked online using the VISTA website. Construction may begin once all the required plans, drawings, details and engineering documents have been reviewed and the full BP is issued. Providing complete and accurate documents prepared to professional drafting standards will enable timely issuance of your BP. Although not mandatory it is strongly advised to engage a professional draftsperson, architect or engineer to prepare construction documents and advise on building code issues. As well, certain aspects of house construction require engineering documents submitted with the BP application. Applications missing this info will be turned away at the counter or returned if applying electronically. Be sure to engage a Professional Engineer early in the drawing preparation process to accommodate any required lead times. The same can be said for the engagement of floor joist and truss manufacturers in the preparation of structural layouts. In addition, be sure to obtain home warranty for all new house construction projects and register this information with the Province of Alberta prior to making your application. Onsite construction of the proposed home may commence once the BP has been approved and issued. During construction a number of inspections are required to take place at defined milestones, typically before foundations are covered with backfill, prior to framing and services being covered with gypsum board, and once more before occupancy. As mentioned previously, construction of below ground works, footings, weeping tile and foundation walls may begin once a 'partial permit' is issued. Since a full permit review has yet to be conducted at the time a partial permit is issued it is at the builders risk to proceed. Should changes be required based on the BP review, it is the builders responsibility to ensure these changes are made. 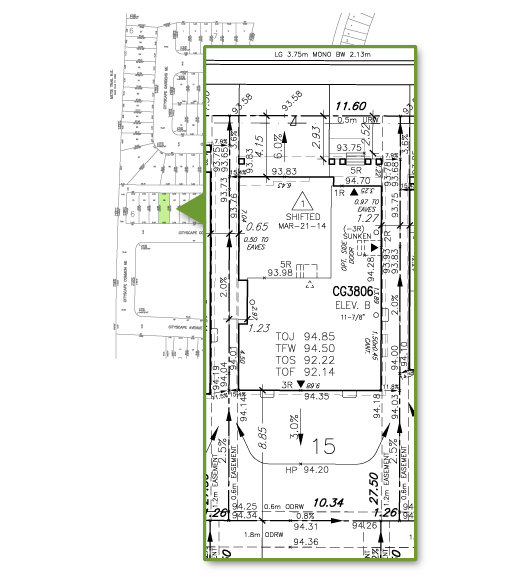 Construction past the subfloor level requires a full Building Permit to be in place. Building in the absence of required permits is subject to a stop work order and additional fees. The builder is required to provide site documentation and to call for inspections (including tradesperson inspections) at required intervals per the New Home Inspection Handbook. A Field Safety Codes Officer (also known as a Field SCO or Field Inspector) will visit the site and an inspection report outlining the findings the inspection will be left onsite or emailed to the builder's site supervisor. an 'acceptable' construction outcome means that work may proceed until the next inspection is required. an 'acceptable with conditions' outcome means that some items require correction, however work may continue (and where deemed necessary the SCO may request a particular item be re-inspected prior to covering or enclosing). a 'not acceptable' outcome means that deficiencies must be corrected and re-inspected prior to proceeding, and that re-inspection fees may apply. Once the house construction is complete a final inspection may be called. Once all inspections are complete and deficiencies have been corrected the applicant may apply for occupancy of the property. Follow the approved drawings. When changes are necessary, apply for a BP revision prior to making the changes to calling inspections. Request inspections when required by calling 311 before 2pm to book for the following day (online booking is currently in development). Correct all deficiencies noted at inspections and ensure to recall inspections when instructed to do so. Do not cover rough framing until the pre-board (also commonly known as the 'framing' inspection) is deemed acceptable. Unless you have applied for the permit online, confirm that current drawings are on site for the field inspector before calling inspections to avoid re-inspection fees. Once construction of the project is substantially complete and all inspections have been approved, occupancy may be granted. This will allow a homeowner to take possession of the home and move into the property. Certain items such as landscaping and grading may not be complete at this time but will not prevent occupancy. The completion of these items may vary in timeline dependant upon the season. The builder is responsible to complete these items in a timely fashion in coordination with the home owner. Show Homes which have reached the end of their allowable two year time frame must have all temporary elements removed and call for a final inspection before occupancy can be requested. The Field Inspector will leave an Application for Occupancy Form on site. At the final inspection all City Inspectors will sign off their acceptance. The Building Inspector will issue an Occupancy permit once all of the inspectors have signed off the project. After the subdivision construction is completed there is a maintenance period for which the developer is responsible. At the end of this maintenance period, The City inspects the subdivision and all defects and damage are noted. When required repairs are completed certificates are issued and performance securities are returned to the developer. This phase is intended to ensure that infrastructure is not only complete but also working correctly and that all obligations on the part of the developer have been met. The outcome is that The City assumes ongoing responsibility for the maintenance of the subdivision. After the issuance of a Construction Completion Certificate (CCC), this phase of the development process typically requires twelve to twenty four months to complete and will likely overlap with Housing Construction. Underground infrastructure (water, sanitary and storm) and landscaping typically requires 12 months and surface works (asphalt, curbs, sidewalks) require 2 winter seasons (approximately 24 months). Certain infrastructure improvements such as storm ponds have longer maintenance periods. At the end of the maintenance period, a verification takes place to ensure that required infrastructure is in good repair and functioning properly. This is accomplished through an inspection of the infrastructure by the City, the contractor and the on-site consultant. Upon successful completion of the inspection, the City will issue Final Acceptance Certificates (FACs) for the various infrastructure that has been constructed. An FAC inspection is requested by the developer, or the developer's Consultant. The City then inspects the infrastructure and upon successful completion of the inspection, an FAC document is issued by The City to the developer. The FAC document is received approximately 30 to 60 days after the inspection has been passed by The City. Retain the services of qualified engineering consultants and contractors per The City's "Consulting Engineer's Field Services Guidelines." and arrange for an inspection by The City when the warranty period is complete. Final Acceptance Certificates can be tracked using a password-protected online system, available to authorized developers and their consultants. Apply for, and arrange, a date for inspection prior to the warranty period ending so it can take place as close to the warranty end date as possible. Prior to inspection, ensure the infrastructure is in good working order and meets all the obligations as set forth under the Development Agreement. This will increase the likelihood of passing the inspection. Follow up with the City post inspection to ensure the FAC document is being processed. The Master Development Agreement contains a section pertaining to the provision of Performance Securities according to a 'tiering' system for developers based on their performance track record. This track record determines proportions and sequencing for the reduction of securities. Any remaining security may be released once all Final Acceptance Certificates have been approved and all other requirements under the Agreement have been met. the direction of the Coordinator of Subdivision Development, Growth Management following approval of the As-built Drawings of the Infrastructure. Ensure all FACs and As-built Drawings have been submitted. Ensure all costs are paid associated with the discharge of the Agreement and any documents pertaining to the Agreement, including but not limited to any amendment to the Agreement. Follow up with City staff to ensure the Development Agreement is being discharged and the status of the discharge. The City shall endeavour to assist the Developer in the recovery of a portion of the costs incurred by it (being the proportionate share of costs based on length of frontage along Boundary Roads and Lanes, exclusive of Oversize) relating to any sanitary sewer, storm sewer, water main and hydrant installations in the Boundary Roads and Lanes, and extensions of these utilities to and from adjacent areas from the developer of the adjoining property prior to the execution of the Master Development Agreement and Special Clauses Agreement by the developer(s) for the said adjoining property, provided that such underground utility will be utilized by the developer of the adjoining property. This condition will be placed on the subdivision conditions of the said adjoining developer to recover the endeavours to assist, payable prior to subdivision approval. The developer will be eligible to collect endeavors from adjoining, benefitting developers for a period of twenty (20) years from the date of said Development Agreement. Ensure all of the eligible endeavors to assist are outlined in the Development Agreement and the mechanism(s) to obtain the endeavors are fully understood. Developers encouraged to communicate with adjacent landowners that are pursuing development approvals to ensure they are aware of the endeavors to assist, the amounts, and when they will be payable.